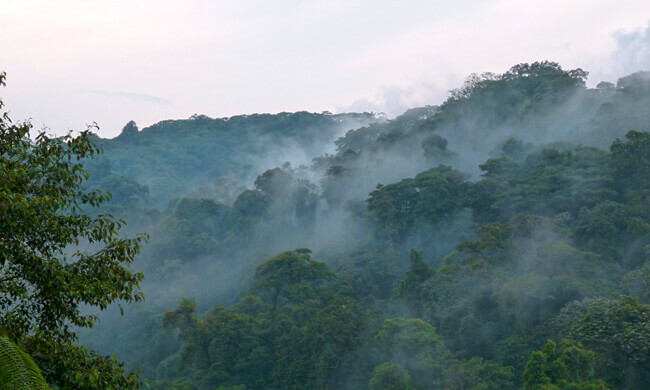 Visit This Reserve & Help Protect the Cloud Forest's Amazing Flora & Fauna! The Santa Elena Reserve was created by the local community’s desire to protect the cloud forest and at the same time use tourism as a means to benefit the area. All entrance fees go to protecting and managing the reserve as well as providing higher quality education for the schools of Monteverde. This is one of the first community-administered reserves in Costa Rica, and as such it is a great example of how local communities can protect their surroundings. The Santa Elena Reserve tour is a great option for anyone who has a true love of nature and is looking to experience the cloud forest first hand. You are picked up from your hotel and driven to the reserve. Your local bilingual guide will take you along 3 hours of hiking trails where you will explore the flora and fauna in this rich forest. Different species of trees, orchids, and lichens are easily found as well as a large range of birds like the resplendent quetzal, hummingbirds, black guan, and toucanet. Some mammals are also observed: howler monkeys, agoutis, coatimundis. If you are lucky, you can see the tapir, ocelot, peccary and puma. Enjoy the wonderful views of the Arenal Volcano and the Guanacaste lowlands. What to bring: Comfortable clothes, camera, rain jacket, comfortable sturdy shoes or hiking boots, binoculars.